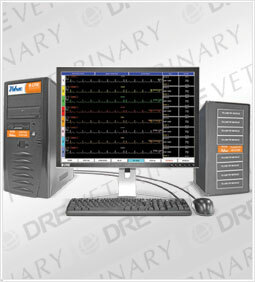 The new DRE Vetrec VST is the next generation Central Station Cardiac Monitor. It's design is based around state of the art computer and software technology. The DRE Vetrec VST is economical, configurable and compatible with the DRE Waveline Pro and DRE Waveline Touch monitors, and includes VST telemetry transmitters for wireless cardiac ECG monitoring. 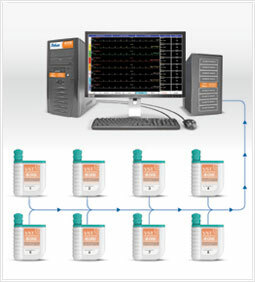 The Arrhythmia Algorithm is built on the same safe, time proven algorithm. 96 hours of information on each patient ( up to 16 patients) is stored on this system. The operating system is powered by Windows 7 Pro and provides a highly versatile platform. The Vetrec VST supports both laser printers and thermal recorders. 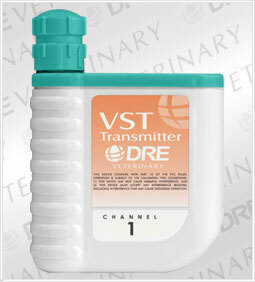 No other system provides the high level of flexibility that the Vetrec VST offers. Each channel of the Central Station is independent, allowing the use of both Stationary and Telemetry Transmitters on a single system in any combination. Hardwire System: Hardwire a DRE Waveline Pro or DRE Waveline Touch monitor to measure more parameters. 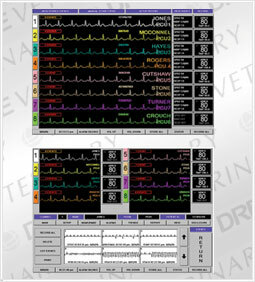 Wireless Telemetry: Use the VST Transmitters to monitor ECG or incorporate a portable wireless bedside monitor for vital signs. Combination of Hardwire and Wireless System: For those who want Wireless Telemetry on Channels 1-8 and want to hardwire a DRE Waveline Pro and/or a DRE Waveline Touch monitor on Channels 9-16. The Vetrec VST uses split screen technology, allowing the monitoring technician to review, edit and enter patient information while maintaining complete control and observation of all patients on the system. 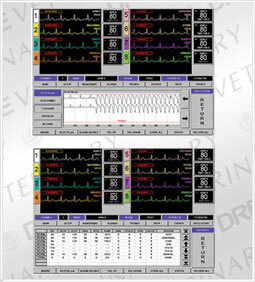 Stationary support includes the presentation of waveforms and all vital signs data. This system is designed to be easy to use, yet completely configurable and adaptable to almost any veterinary hospital configuration. Often used for, but not limited to: Pre & Post Surgery, ICU, Immediate Care, Ambulatory Monitoring, and Recovery. Peace of mind with mirrored hard drives - both will continue to run and if one fails the back-up will allow you to continue monitoring, preventing any interruption or lost data. Vetrec TS CPU, Receiver Station, Standard 19" LCD Color Monitor, Laser Printer, Up to 16 VST Transmitters, all necessary hardware cables, and 2 antennas. Bedside monitor (DRE Waveline Pro and/or Touch), additional antennas for extended range throughout your facility, LCD monitor (size), Flat screen viewing monitor (size), Wall mounting bracket. Contact a DRE representative, and they will work with you from start to finish creating a complete system that fits your facility’s needs.